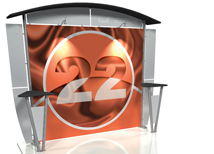 The Linear Pro Hybrid Display System is one of the best values in the trade show industry. 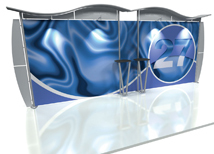 It is a very high quality product that is available in multiple styles that will make your company stand out. The Linear PRO has two different canopy options and is available in 20 foot models! The Linear PRO system can support large monitors and has optionional stand off shelves for added stability and functionality. 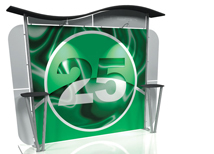 The Linear PRO system is a major upgrade from pop up displays with only a minor cost increase! Linear PRO displays are quality US made systems that have multiple options available and are built to last. 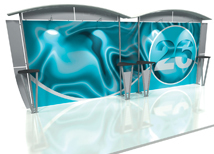 Linear PRO displays are built by Orbus Company and Origin Exhibits which are two highly regarded companies that are know for producing very high quality products at affordable prices, with custom design capabilities. Northwest Creative Imaging carries every line of Orbus and Linear products at close to manufacturer direct prices. We can accomplish this because we run a sustainable business that is lean and focused on one goal. This allows us to reduce overhead and pass along the savings to you. All of our Linear PRO displays are priced to compete with lower quality substitutes that do not compare in quality. We do this so that our customers are not forced to purchase a lower quality display because of a limited budget.